Banana Caramel Cake – Voila! Wow. Just wow. Who would’ve thought to poke holes in a cake? 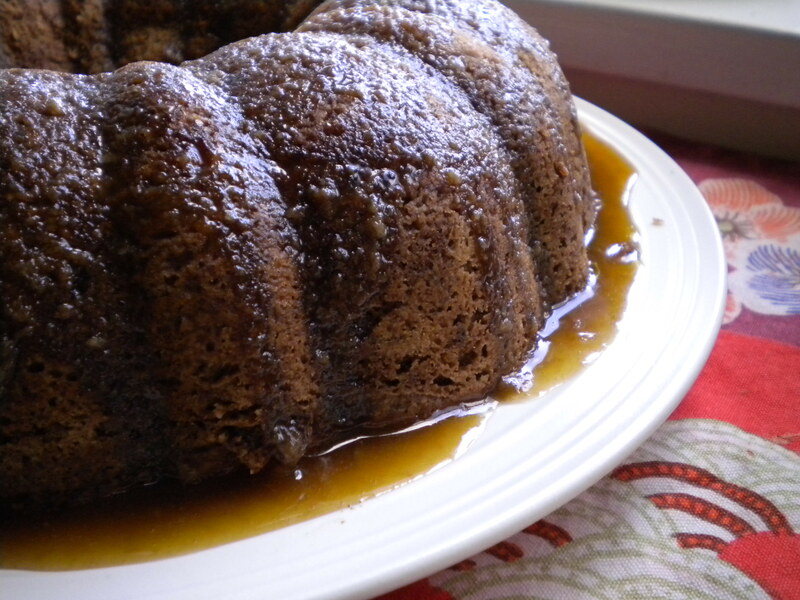 The caramel sauce is drizzled over so that it infiltrates the cake and pools at the bottom of plate…yum. What else can I say – this is darn good cake! Mouthwateringly good, plus a true crowd pleaser. 1. Sift together flour, cinnamon, nutmeg, cloves, salt and baking soda. 2. In a larger bowl, combine the eggs, oil and sugar. Mix on medium speed for 2 to 3 minutes. 3. Add the vanilla extract and mix for another 30 seconds. 4. Add the dry ingredients a bit at a time. Scrape down the sides of the bowl every now and then to ensure everything is incorporated. 5. Once the dry ingredients have been combined, gently fold the walnuts, chocolate and bananas. Don’t over mix. 6. Spoon the batter into the prepared pan. Bake for 50-55 minutes, or until a toothpick/knife comes out clean. Unmold cake onto pan. Don’t force the cake out, just let gravity take over and the cake will drop out cleanly. 1. About 5 minutes before the cake is done, make the caramel by combining all the ingredients in a small pan. Bring to the boil and stir occasionally to ensure that it doesn’t burn. Let it boil for about 5 minutes and then turn off the heat. 2. Once the cake is out of the oven and unmolded, poke holes all over the cake with a skewer. Immediately pour the caramel over the cake, stopping every now and then to let the caramel sink in. If the caramel pools in spots, poke more holes to allow it to sink in. honey….I just made this cake, and along with some friends, ate it all up! it was DELICIOUS! A big hit here! I served it with vanilla ice cream on the side and hot tea – a perfect combo! I’m so glad to see you enjoyed this cake – what a beautiful pan you used!